IT MAY be common for food chains to start franchises, but it is not so for social enterprises, which tend to find it hard to keep afloat while doing good. 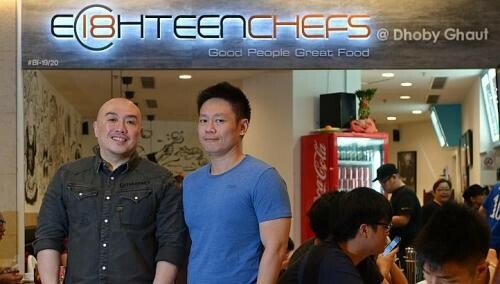 But Western food chain Eighteen Chefs, which employs ex-offenders, is believed to be the first social enterprise here to start a franchise outlet. This was opened three months ago at The Cathay by two lawyers and an accountant, who paid for the right to replicate an Eighteen Chefs outlet at the mall in Dhoby Ghaut. Industry observers say this shows that social enterprises, which number about 200 here, can have winning business models that attract investors. "It's excellent that there's a social enterprise here whose business model works and attracts people to start franchises," said Mr Noel Hon, chairman of the President's Challenge Social Enterprise Award (PCSEA) committee last year. He and at least two other observers have not heard of any local social enterprise starting a franchise previously. There are, however, social enterprises overseas with franchises here. For instance, Dialogue in the Dark Singapore, which was brought to Singapore in 2007 by Ngee Ann Polytechnic from Germany, employs visually impaired guides to let people experience what it is like to be blind. Generally, social enterprises, or businesses that seek to plough their profits into social causes such as giving jobs to the disabled, have found it hard. In 2009, about a third of the 73 social enterprises in a funding scheme here failed. The Social Enterprise Association was then set up to help in 2009 and now has about 150 social enterprises. Eighteen Chefs, which won the PCSEA in 2012, is an example of a successful social enterprise though, noted the association's executive director, Mr Alfie Othman. Set up in 2007, Eighteen Chefs now has two branches, at Tiong Bahru Plaza and Cathay Cineleisure Orchard, on top of its new franchise outlet. It also has a Simei branch under renovation and will open a new branch in Ang Mo Kio next month. Lawyers Nicholas Chan and Danny Teo, both 48, and accountant Dylan Quek, 39, were keen on an Eighteen Chefs franchise as they were interested in giving back to society. Besides having to hire ex-offenders and adopt the same logo, the franchise outlet also has to have music and "graffiti" decor similar to the other branches. Mr Chan said he did not think hiring ex-offenders would affect the outlet's profits. "We tried the food at one of the other outlets and the food was good," he said. Chefs and service staff at the franchise outlet were trained for a month at other branches to ensure consistent food and service quality for all. Mr Jovan Yeo, 19, was among the lunch crowd at The Cathay outlet last week. The full-time national serviceman said the food was "up to standard", like that of the other branches he had patronised. Eighteen Chefs founder Benny Se Teo said it was important for social entrepreneurs to have the business acumen to do well. "It would be sad if people just came to us out of sympathy," he said. "It's business first. At the end of the day, we're a business that sells food."